The endangered European wildcat (Felis silvestris silvestris) is represented, today, by fragmented and declining populations whose genetic integrity is considered to be seriously threatened by crossbreeding with widespread free-ranging domestic cats. Extensive and recent hybridisation has been described in Hungary and Scotland, in contrast with rare introgression of domestic alleles in Italy and Germany. In Portugal, the wildcat is now listed as VULNERABLE in the Red Book of Portuguese Vertebrates. Nevertheless, genetic diversity of populations and the eventual interbreeding with domestic cats remain poorly studied. We surveyed genetic variation at 12 autosomal microsatellites for 34 wild and 64 domestic cats collected across Portugal. Wild and domestic cats were significantly differentiated both at allele frequencies and sizes (F ST=0.11, R ST = 0.18, P < 0.001). Population structure and admixture analyses performed using Bayesian approaches also showed evidence of two discrete groups clustering wild and domestic populations. Results did not show significant genetic divergence among Northern, Central and Southern wildcats. Six morphologically identified wildcats were significantly assigned to the domestic cluster, revealing some discrepancy between phenotypic and genetic identifications. We detected four hybrids (approximately 14%) using a consensus analysis of different Bayesian model-based software. 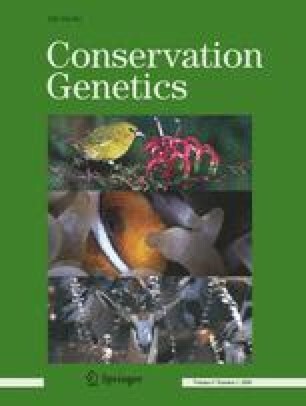 These hybrids were identified throughout all sampled areas, suggesting that hybridisation is of major concern for the appropriate implementation of wildcat conservation strategies in Portugal. We thank Armando Loureiro from BTVS-ICN (Wild Animal Tissue Bank, Portuguese Conservation Institute), Pedro Monterroso and Dra Maria Antonieta Ferreira for providing samples. We also thank to all veterinarians and biologists that assisted in sample collection. We are grateful to Massimo Pierpaoli for helpful comments on data analysis. Rita Oliveira is supported by Fundação para a Ciência e a Tecnologia (FCT) through a PhD grant SFRH/BD/24361/2005.